Today (February 28, 2006), Apple announced two new products at a special Apple event. The first product was an Intel based Mac mini (Intel Core processors) and the second was a stereo system called the iPod Hi-Fi (compatible with all iPods). Another minor release was $99 leather cases for the iPod nano & video. Two versions of the Intel Core Mac Mini were announced. The first one has a 1.5GHz Intel Single Core processor, 60GB hd, DVD/CDRW, and costs $599. The second edition has a 1.67GHz Intel Dual Core processor, 80GB hd, dual-layer DVDÂ±RW/CDRW, and costs $799. Both have 512MB of ram and an Intel 64MB graphics card. They also have WiFi, Bluetooth, Gigabit Ethernet, FireWire 400, and more. The Mac Mini now has an infrared port for the remote which controls the Front Row program that it now includes. Front Row allows easy access to photos, music, and movies; a new feature now allows sharing content across networks. The second product was the iPod Hi-Fi. 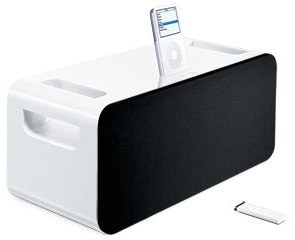 The Hi-Fi is a stereo set, which as a dock atop to connect either the iPod nano or video. (iPod shuffle can be plugged in using a port on the back) When the iPod is plugged in, the backlight will be turned on and album art will be displayed. (will also charge your iPod) The Hi-Fi can also run on 6 D-cell batteries, but is unlikely most will carry such large speakers around. (17″x 6.6″x 6.9″) This is pretty much an expensive Apple branded pointless speaker set to compete with 3-party devices. Overall the entire “special” event was a disappointment. The Mac Mini with an Intel processor was expected to be released eventually just as an Intel based Mac G5 is expected. Next, the iPod Hi-Fi was a completely pointless invention and is way too expensive for anyone. Finally, the new leather iPod case is unusable while in the case, making it useless! Therefore, nothing really impressive was announced at the keynote. what ipod stereo would u recomend getting? are the zip connect ones from sharper image good?